The long sling can be tied in a variety of ways. The most popular ties include a pocket wrap cross carry, kangaroo carry and a back carry. Each sling comes with detailed instructions of tying, they present step-by-step, how to tie the sling correctly. The slings we sell are 100% combed cotton or with additives. Depending on the composition, there are appropriate ways of washing the sling. Before the first use, we recommend washing the sling in order to make it softer. Cotton slings should be washed in 400C, slings with additives – in 300C. The slings should be washed in delicate washing liquid or powder for baby clothes. You can return any product within 14 days since the day of purchase without giving any reason. You can try, adjust and check if a carrier you’ve ordered is right for you. If you’d like to return the carrier, just send it back to us and we will return the payment on your account. All the products are covered by a 24-month warranty. For more details go to Shop Regulations. 1. Which sling should I choose at the beginning of babywearing? 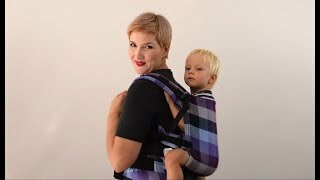 Can I buy one sling for the whole babywearing period? 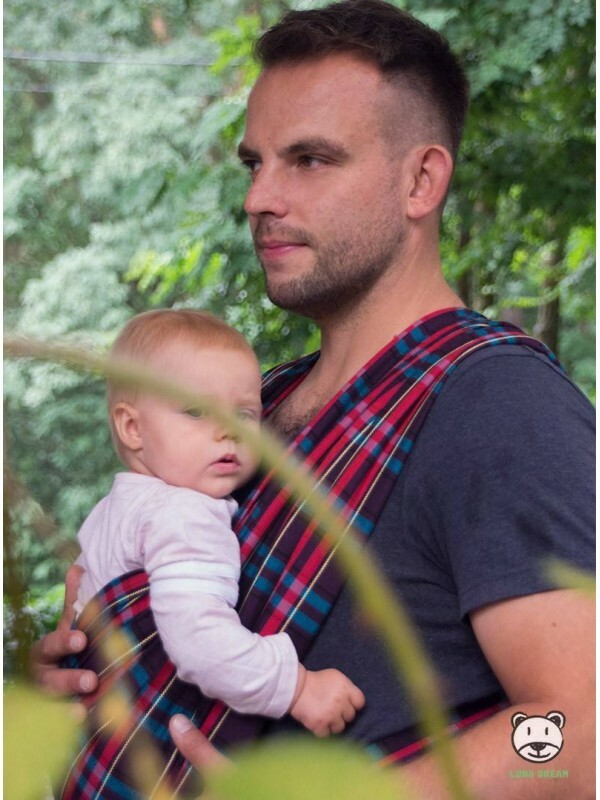 If you’d like to wear your baby for the first time and your baby was born a few days or months ago, then you should choose a thinner, broken-twill or diamond weave sling with the weight of about 220-240g/m2. Striped or checked slings are really helpful while you’re learning babywearing. Such slings have edges clearly marked with different colors. For persons who are experienced in babywearing or who prefer different patterns, we’ve prepared Maze Basic - The First Jacquard Sling. Its grammage is low and it’s an amazing alternative (also in terms of the price) for a striped sling. 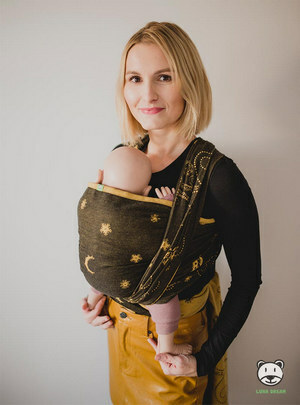 (All our ‘’beginner’’ slings are here: https://lunadream.pl/en/45-slings-for-beginners). If you’d like to begin your babywearing adventure when your baby is a bit older (six months or more) or if your baby’s birth weight was a bit higher and the baby puts on weight pretty quickly, then it’s a good idea to choose a thicker sling, woven with jacquard weave, with grammage of about 250-280g/m2. 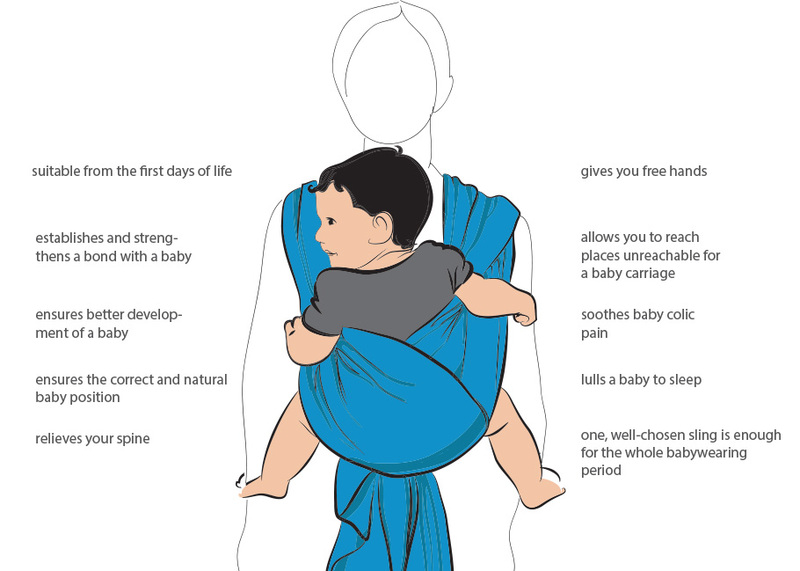 Such sling should suffice for the whole babywearing period. (Here are our jacquard slings - https://lunadream.pl/en/35-jacquard-slings). 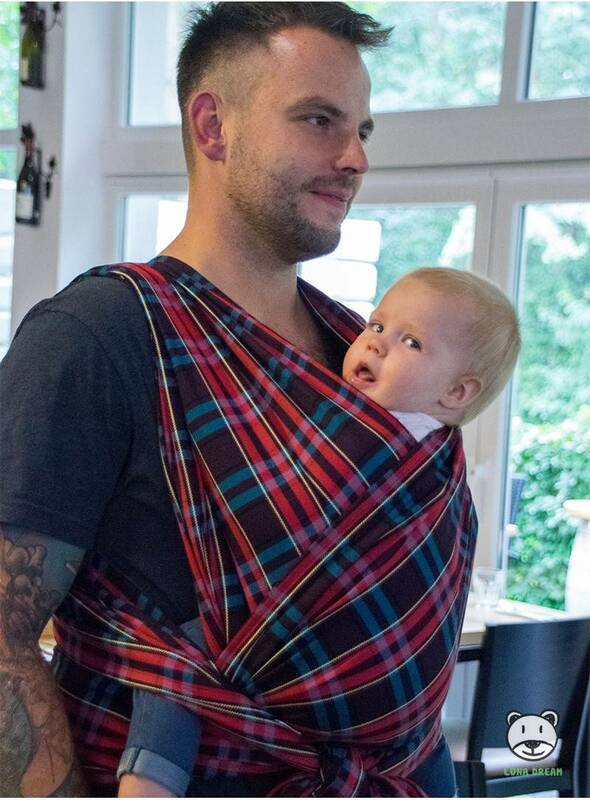 One sling for the whole babywearing period? Yes! The composition including combed cotton, soft from the very beginning, edges clearly marked with different colors and fabric folded in opposite direction – all of these are advantages that make our jacquard slings perfect both for the beginning and for the whole babywearing period. Choose your favorite design of jacquard sling and enjoy babywearing. 2. Why slings with the same composition have different prices, what are their differences and which one should I choose? Our 100% cotton slings are one-size-fits-all, however they can vary in their price because of many reasons. The cheapest slings are woven with broken-twill or diamond weave, they are thinner and, usually, striped. Jacquard cotton slings are more expensive since the process of weaving them is more complex, such slings consume more thread because they are thicker. If price discrepancies occur within the same type of slings, they may be related to sling thickness, complexity of a pattern, color gradation or other color transitions or an additional colorful thread (the thread is visible on any sling pattern as a separate color, which makes such sling more beautiful and unique). However, if slings have the same grammage, weave and similar pattern, the price differences can be the result of a company price policy. 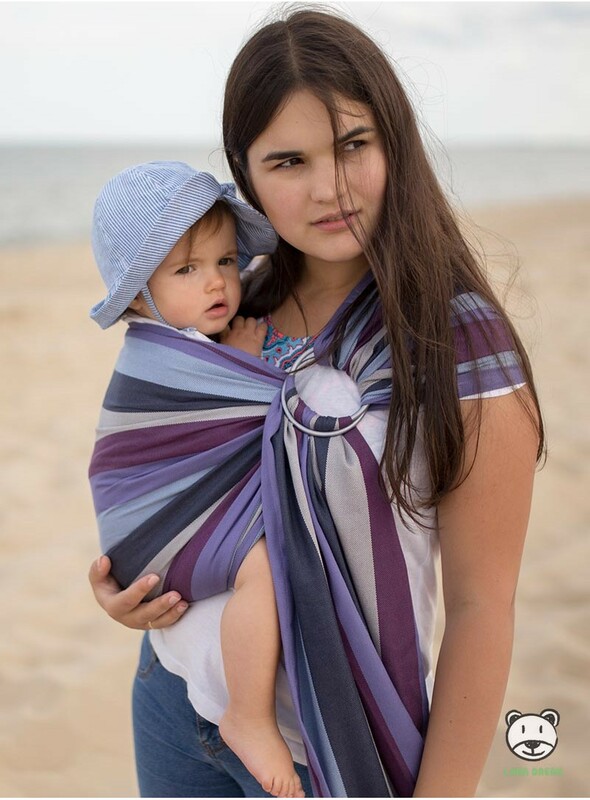 That’s why we offer some slings at a very affordable price, for example Magic Summer design (https://goo.gl/4xiv98). These slings are no different in terms of the quality, durability, they have all the certificates and comply with the relevant standards. That’s why the sling choice depends only on your color preference and taste. 3. 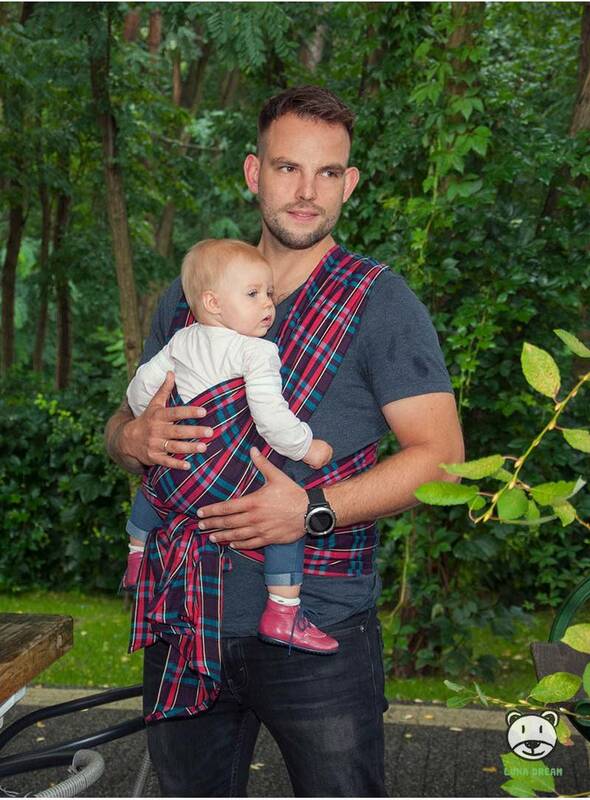 I’d like to babywear but I don’t think I can tie a sling properly. Would it be easier if I chose a ring sling? A ring sling is definitely easier to tie and if you’re really worried about tying, choose the ring sling as your first one. 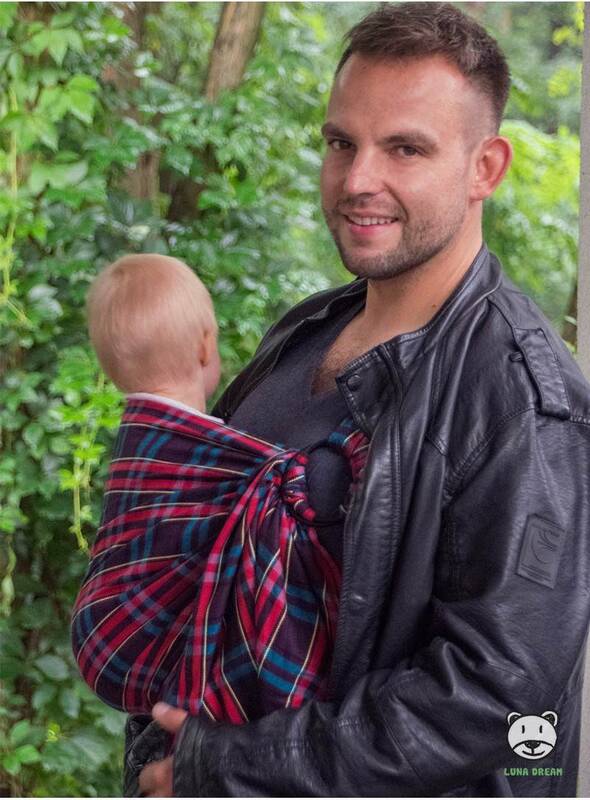 The disadvantage of such sling is uneven distribution of baby’s weight onto your shoulders. It’s recommended to change the tie every 30 minutes so that none of your shoulders is strained. 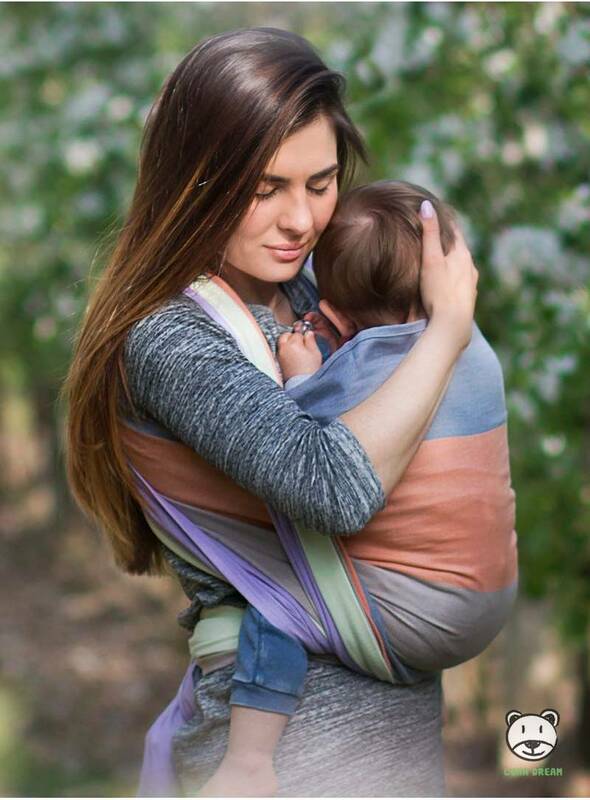 The ring sling is useful as an additional sling – for short walks, shopping, and for an older child who is tired of walking and you didn’t take a stroller. (Here are our ring slings - https://lunadream.pl/en/21-ring-slings). 4. Should I choose a 100% cotton sling or the one with additives (bamboo, linen)? 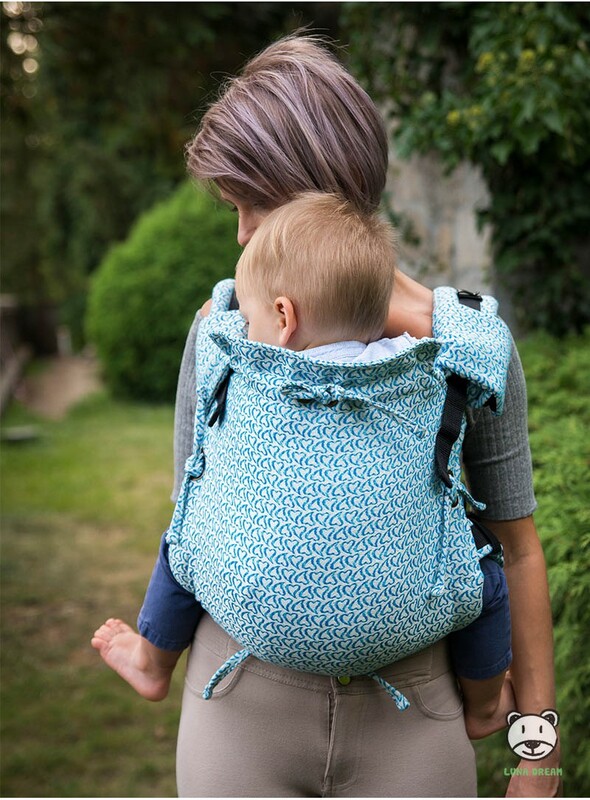 A sling with linen additive is great for older and a bit heavier children, for experienced parents or when you start babywearing adventure with an older child. Such sling can be more difficult to tighten or to learn how to tie it, it is often thicker and has bigger carrying capacity. 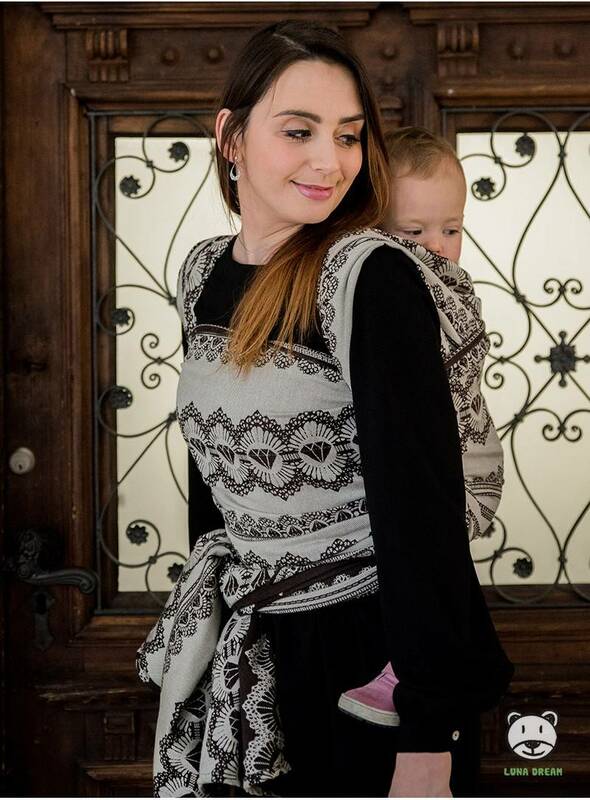 It also serves for a longer period of time because it allows to babywear an older and heavier child without any discomfort or larger effort, since the weight is distributed evenly and barely noticeable. 5. Which sling size should I choose? 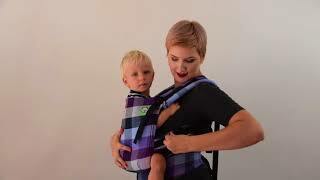 The size of sling should be accurate for the babywearing person, it doesn’t depend on baby’s weight or age. You should remember that different types of ties consume more or less sling fabric. For example, the least fabric-consuming types of ties are “kangaroo carry” and “back carry”, more consuming are “2X” and “DH – double hammock”. The only way to perfectly match a sling with a tie is to buy as many slings as many carries you’d like to tie. The lengths given above are one-size-fits-all sizes, which means they allow you to tie any carry you wish, provided that you’ve calculated the size of your clothes correctly. 6. My husband would also like to babywear. Should we buy two slings? If you and your husband have a similar build, then one sling is enough. If your husband is slightly taller than you and there is no more than one size of difference between you two, then you should buy a sling one size larger than in the 5th question. In such case, a smaller person may end up with more fabric left after tying a sling, creating a “tail”. You can wrap the remaining fabric around you one extra time or tie an additional knot out of it. 7. How can I learn to tie a sling? The process of tying a sling can seem complex at first glance, but after some practice it will only take 2-3 minutes. 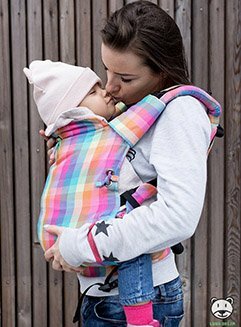 Everyday babywearing, dozens of repetitions, positive attitude and time – these are the conditions that allow you to become friends with the sling and fall in love with babywearing. Each sling comes with a user’s manual. 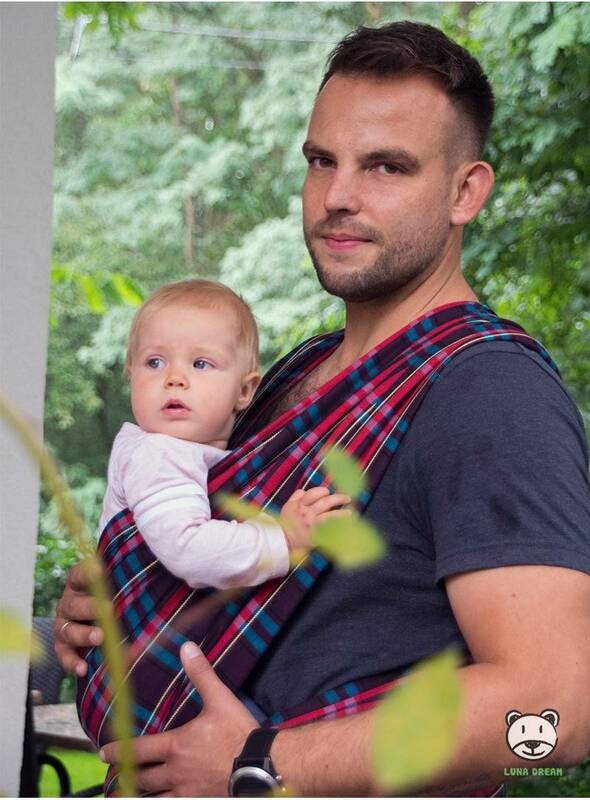 However, it’s best to learn babywearing under a watchful eye of a Sling Advisor or an experienced friend (here is the list of Sling Advisors in Poland: https://lunadream.pl/content/category/25-zapytaj-doradce-noszenia). They can show you the rules of correct tying and tightening the sling, observe possible mistakes and correct them at the very beginning so that they don’t occur in the future. They will also make sure you don’t get discouraged and actually love babywearing. Printed user’s manual and youtube videos on Luna Dream channel (https://www.youtube.com/channel/UCTp51MOViLjl7_oHrYpnytA) will help you to learn more and remind the details you may have forgotten before you tie a sling on your own. 8. My child runs away as soon as they see the sling. How can I convince them to babywearing? In most cases, children don’t like the moment of tying, usually at the beginning, when we are not confident with the sling and focus a lot on every single step of tying. But after a baby is already in the sling and feels comfortable, close to a parent and able to observe the world, it’s a way more pleasant experience. That’s why, before you start tying the sling, it’s good to relax a bit and play with a baby – they always mirror our emotions. You can use the sling to play “hide and seek” to make a baby more familiar with it. You can cover your head with the sling, then cover a baby for a moment, play “peek-a-boo” or just fool around. Then you may suggest tying the sling by saying: “Now I’m gonna put you inside and…hide you!”. In addition, if a baby keeps refusing, you can use as many tricks during tying as you wish, including the forbidden things, like watching TV, swaying, singing and dancing during the tying, try giving keys or a bracelet to a baby, talk or ask someone from your family to talk to a baby, make funny faces while tying in front of the mirror. Do whatever it takes to make babywearing fun and joy for your baby, something that associates with a nice walk for both of you, you can give to your baby his or her favorite teddy bear. 9. How long can I use one sling? When should I buy another one? Slings may serve you for many years, however, the thinner it is, the more you feel the weight of your baby during babywearing, the fabric may pinch your shoulders and the spot under baby’s knees. Slings with 220 – 240g/m2 grammage can carry babies up to 10 kg, so when a baby is about 1 year old you may look for another sling. Slings with 250-280 g/m2 grammage usually are enough for the whole babywearing period. 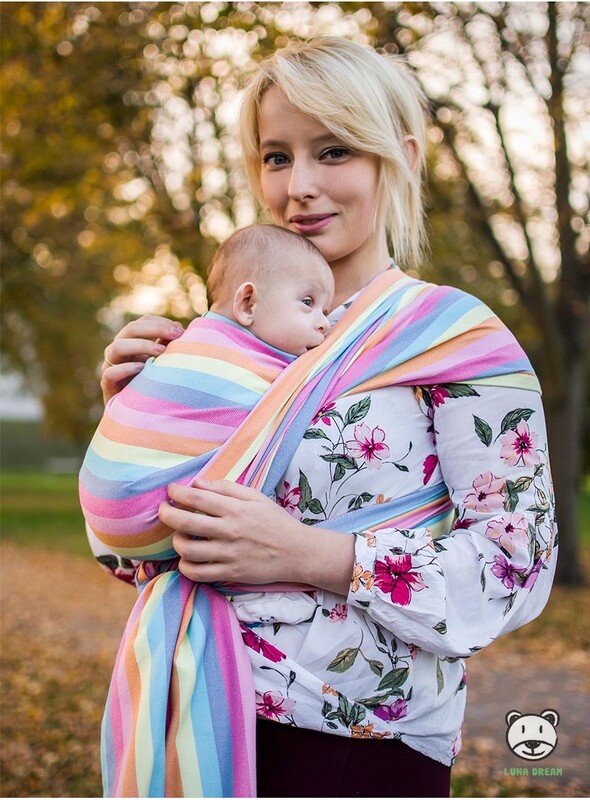 It means that we can replace a sling with a new one only when a baby is too heavy or if we simply would like to have a different color or pattern. Your second or third sling should be 100% cotton with 280-350 g/m2 grammage and optional additives, such as linen or wool, which enhance sling carrying capacity. Such slings will be more than enough for the whole babywearing period, since the thicker a sling is, the more comfortable it is. 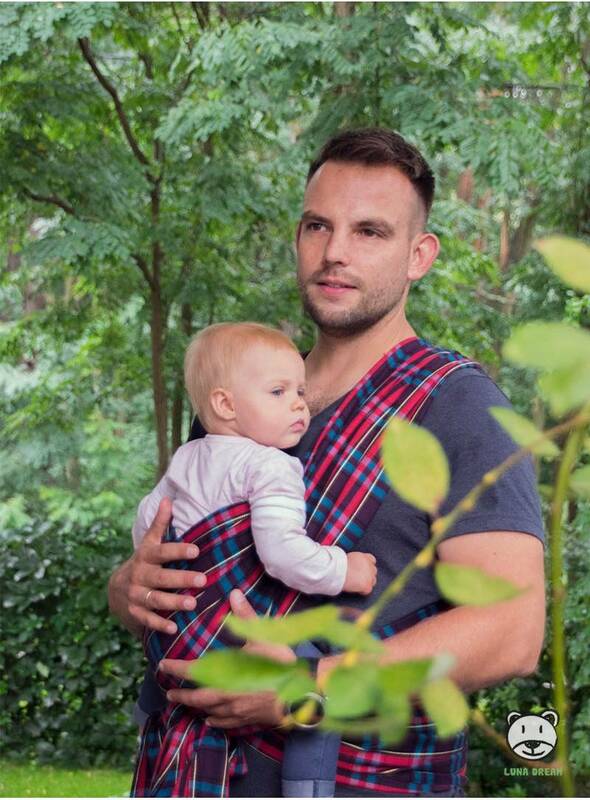 Thick sling creates soft “pillows” on your shoulders and distributes baby’s weight evenly, relieving the spine. 10. What can I do with the sling I don’t need any more? The sling is just fine for many years, colors remain vivid and the more “loved” is the sling, the softer it becomes. You can leave it for your next baby, you can sell it or make a baby carrier out of it. You can use it as a blanket, a table cover, a throw, make a pillowcase, a skirt or just keep it as a memento (Here you can find our bags and other sling accessories.